Quick Order Package 22S, 4-Wheel Disc Brakes, 6 Speakers, ABS brakes, Air Conditioning, AM/FM radio: SiriusXM, Automatic temperature control, Brake assist, Bumpers: body-color, Convertible roof lining, Convertible roof wind blocker, Delay-off headlights, Driver vanity mirror, Dual front impact airbags, Dual front side impact airbags, Electronic Stability Control, Four wheel independent suspension, Front anti-roll bar, Front Bucket Seats, Front Center Armrest, Front fog lights, Front reading lights, Fully automatic headlights, Glass rear window, Heated front seats, Illuminated entry, Leather Shift Knob, Leather Trimmed Seats, Low tire pressure warning, Occupant sensing airbag, Outside temperature display, Panic alarm, Passenger vanity mirror, Power door mirrors, Power steering, Power windows, Radio: AM/FM Bluetooth w/7" Display, Rain sensing wipers, Rear anti-roll bar, Rear window defroster, Remote keyless entry, Speed control, Speed-sensing steering, Steering wheel mounted audio controls, Tachometer, Tilt steering wheel, Traction control, Trip computer, Variably intermittent wipers, and Wheels: 17" x 7.0" Premium Silver Aluminum. 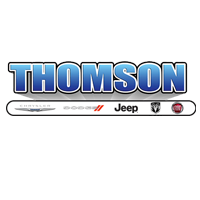 Thomson Chrysler Dodge Jeep Ram FIAT - "Where We Make Buying Easy!!" New vehicle pricing includes all offers and incentives. Tax, Title and Tags not included in vehicle prices shown and must be paid by the purchaser. While great effort is made to ensure the accuracy of the information on this site, errors do occur so please verify information with a customer service rep. This is easily done by calling us at (706) 671-2435 or by visiting us at the dealership.